Foxconn Technology Group and its Chairman and Founder, Terry Gou, today announced plans to invest $100 million in engineering and innovation research at the University of Wisconsin–Madison, while also creating the framework for a science and technology institute that will collaborate closely with the company’s facilities in southeast Wisconsin. The Foxconn investment will include funding to help establish a new interdisciplinary research facility for the College of Engineering on the UW–Madison campus. Gou and other senior Foxconn executives visited campus Monday and with university officials signed several agreements designed to formalize and streamline their future working relationship. FIRST will have its main location at the Wisconn Valley Science & Technology Park near Racine and will also have an off-campus presence in Madison. 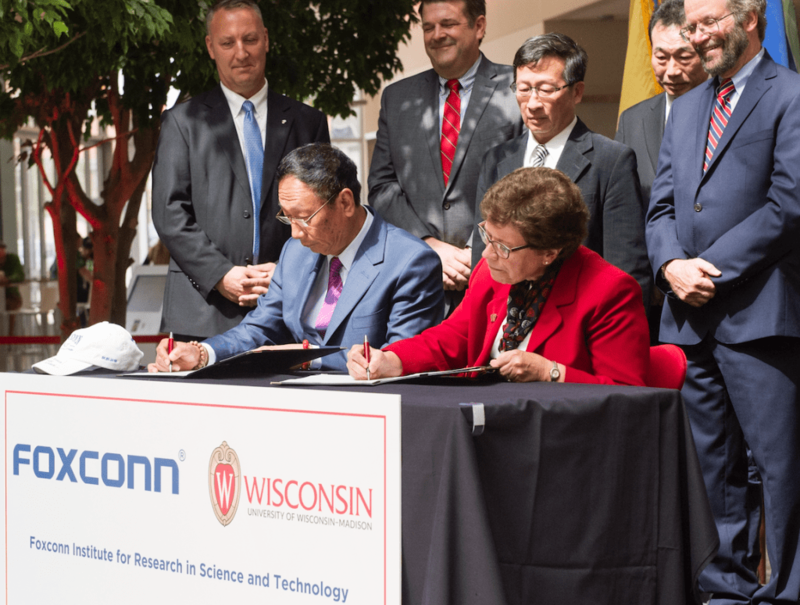 The agreements formalize UW’s commitment to being part of research efforts at FIRST and Foxconn’s commitment to activities such as research, recruiting, creating opportunities for internships and hands-on work in campus labs. In addition, the planned Engineering building will enhance the college’s capabilities and allow it to be an active partner in research of mutual interest with FIRST. “At Foxconn, we see our role as not only being a major investor in Wisconsin, but also a long-term partner to the local community. This includes promoting a vibrant environment that nurtures and enables Wisconsin’s talented workforce, allowing them to tap the immense opportunities that Wisconn Valley has to offer,” said Gou, founder and CEO of Foxconn Technology Group. The multifaceted, interdisciplinary partnership to help develop the state’s research and engineering talent is both the largest industry research partnership and one of the largest gifts in the history of the university, said Chancellor Rebecca Blank. With Foxconn’s lead gift of $100 million, UW–Madison plans to raise an additional $100 million as part of a $200 million fundraising subcampaign in the final two years of the $3.2 billion All Ways Forward campaign. The initiative will focus on supporting research that advances engineering, data and computer science and human health. The bulk of the Foxconn gift will go toward a new interdisciplinary facilty for the College of Engineering to replace 1410 Engineering Dr., complete details of which will be announced at a future date. Blank emphasized her appreciation to Foxconn and Gou for their generosity to the university. “UW–Madison and Foxconn share a commitment to pushing the boundaries of knowledge through interdisciplinary research and we are deeply grateful for Chairman Gou’s support and partnership,” she said. “The partnership combines the strengths of two global leaders — one of the world’s top high-tech manufacturing companies and one of the world’s top universities. The partnership aligns with Foxconn’s continued efforts to identify linkages between academia and industry to drive technological advancement and to establish a talent pipeline to meet the opportunities presented by the Wisconn Valley Science & Technology Park, which is expected to create 13,000 high-value jobs in the state. Areas of potential study could include Advanced Technology on Panel (AToP), biochips, semiconductors, application-specific integrated circuits (ASIC), smart building, smart infrastructure and smart city development, high-performance computing, high-speed communications networks, cloud server storage, sensors, robotics and IT systems. There will also be a focus on advancing research on human health in areas such as genomics, immune cell research, clinical data integrity and processing, and medical imaging in cancer and related diseases. The two parties will also work together to identify and develop initiatives to promote technological advancement, education and scientific outreach. Established in 1974, Foxconn Technology Group (“Foxconn”) is the global leader in manufacturing services for the computer, communication, and consumer electronics (3C) industry. A multinational company headquartered in Taiwan, Foxconn offers many of the leading U.S. and international companies in electronics a one-stop integrated manufacturing solution. Foxconn generated total annual revenue of $158 billion in 2017 and was ranked No. 27 on the 2017 Fortune magazine Global 500. The company has facilities in Asia, Europe and the Americas. Foxconn is leveraging the potential of cloud computing, mobile devices, the Internet of Things, Big Data, artificial intelligence, networks, and robotics and automation in its transformation as a leading high-tech enterprise and industrial internet company. The company has research centers and testing laboratories internationally and has received more than 83,500 patents worldwide. In addition to maximizing value creation for customers, Foxconn is also dedicated to enhancing the concept of environmental sustainability in the manufacturing process and serving as a best-practices model for global enterprises. UW–Madison, a public land-grant institution established in 1848, is a world-renowned university offering a comprehensive array of academic and professional programs. Award-winning research spanning the academic disciplines has earned UW–Madison a place among the world’s elite institutions of higher education. The university’s research enterprise is a catalyst for a powerful economic engine sparking innovation and discoveries to benefit the state of Wisconsin and beyond.